The biggest news at Chez Zero is that my big baby girl Delma turned 3. Oy. We have celebrated primarily with rousing, enthusiastic tantrums and time-outs. And also jumping around in a new purple leotard and eating purple cupcakes. 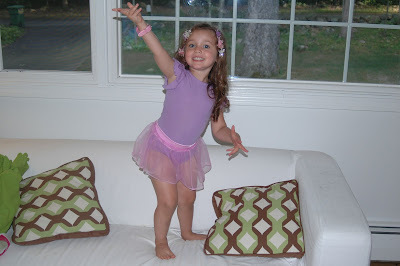 Delly had a gymnastics party with her little friends this past weekend, it was really great. Thankfully the day wasn't very hot, so it didn't smell too badly like a litter box in the gym. The big kids who work there did a good job of keeping the little kids herded (reminded me of that commercial about herding cats), and the littles all had a ton o' fun. They also did not like sharing toys and at least half were crying at one time or another, but that's life in a room full of preschoolers! And Delly made out like a bandit in the gift department, lots of crafty stuff and dress-up stuff. And her first Barbie, which I am particularly excited about. This really has been a tough couple of weeks for Delly. The lead-up to her birthday, with all of the excitement and anticipation... And she's officially moved now into the pre-school room at daycare, which is great for her because most of her friends have moved over already in the past few months and now they're all together again. But she's leaving a teacher whom she loves very much and that has been hard. Big changes for a little girl, and it's taking its toll on us all. I'm assuming that we will all survive this. Fingers crossed.